This January you can literally live the dream with Dream Bingo! That's because you'll have the chance to win a Year of Free bingo bonuses, plus win your deposits back! 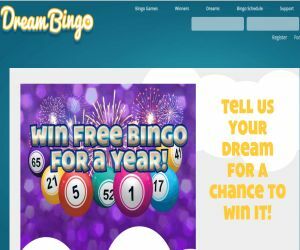 Win Free Bingo On Us! What better way to start the new year than to sit back, live it up and roll your way to winning one year of Free bingo bonuses! Just think of how much you can spend on bingo tickets throughout the year! If you win, you can save all that extra money, or put it towards the latest hot gadget or that dream item you always wanted for 2016! You can also have a free bingo ride to play through the year for free and scoop as many winnings as you can! To be that lucky dreamer, simply deposit and wager £10 or more on bingo before midnight on January 31st. You can then enter the prize draw to win up to a huge £50 Bingo Bonus for every month of the year, which starts from February 1st until December 2016! There's only a few days left, so head to Dream Bingo, stop day dreaming and start playing to win! Dream Bingo is being extra generous this month, as not only can you scoop a year's Free bingo, you can also have the chance to win your deposits back! So, this means when you deposit and play daily until 31st January, you could be one of the lucky dreamers picked at random to win back your deposit! If you're picked, you can scoop a super cool Casino Bonus! Makes sure you catch your deposit back bonus before it's gone!